Sensory Integration (SI) processing is the way our nervous system processes and interprets neurological messages it receives from our 7 senses. 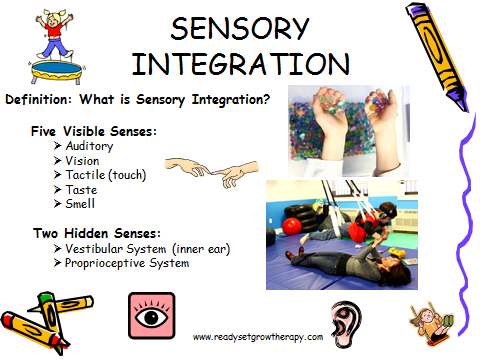 Typical sensory integration processing is what allows us to respond, react, and integrate information received from theses senses in an appropriate way. We are taught that we see with our eyes, touch and feel with our hands, smell with our noses, taste with our mouth, and taste with our mouth/tongues. The Vestibular System is typically fully developed in babies who are full term. The vestibular system is composed of 3 structures in the middle ear: the semicircular canals, the saccule, and the utricle. The Proprioceptive System is what allows us to know where our body is in relation to space. Information received from our propioceptors (receptors found in our muscles, joints, tendons, and ligaments) is what allows us to know whether we are standing on one leg, sitting with our legs crossed, stomping with our feet, leaning to the right, and so on. Right now, as I write this, I know that I am sitting down on a chair with my feet intertwined. I also know that I am slightly tilting my upper body towards my computer. I did not have to rely on my visual system to know this. In addition, I am fully aware of exactly where I am sitting in relation to my environment or space (I did not have to look). Sensory Integration (SI) Therapy is a therapeutic intervention practiced by occupational therapists. 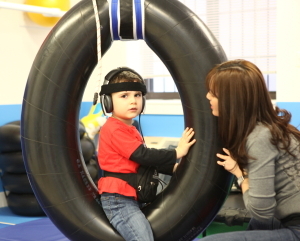 SI therapy may benefit children who present with inadequate processing or integration with one or more of the 7 senses. A child that is constantly bumping into people or tripping over obstacles may present with decreased body awareness (proprioceptive system). A child that cries when placed on a swing may present with gravitational insecurity or an over-reactive response to vestibular input. A child that is constantly mouthing, sucking, or chewing on non-food objects may benefit from an oral-motor “sensory diet”. A child that presents with low energy and moves slowly may benefit from increased vestibular, proprioceptive, and auditory input. A child that is constantly “on the go” or cannot sit still may benefit from pushing and pulling “heavy work” resistive activities that provide intense somatosensory tactile, proprioceptive, and vestibular input. The end result is to help children achieve a more adaptive response that results from an improvement in their central nervous system processing. This may lead to improvements in attention, behavior, learning, speech development, movement, coordination, and social/emotional coping response skills.